Asphalt Services, Inc. has been providing commercial paving and asphalt maintenance to the industrial and commercial industries for over 30 years in the New England area. We have the staff and experience to make sure your job is done correctly and on time. Our services range from complete parking lot reconstruction using reclaiming, milling or excavation techniques; we also offer sealcoating, crack filling, asphalt patching, asphalt resurfacing and new construction parking lots. What sets Asphalt Services, Inc. apart from the rest is the quality of the entire service you get. Not only do you get the best paving product around, but you also get the best service from start to finish. We specialize in keeping commercial properties open and functional during our projects. We make sure to minimize the disruption to all tenants, delivery drivers, guest, and employees of the buildings we service. 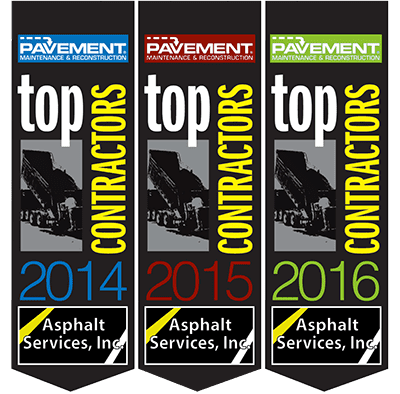 Our excellence in these services was recognized when we were named one of the nation’s top Paving, Sealcoating, Pavement Repair and Striping contractors for the third year in a row. Our professional team will meet and exceed your project goals. It doesn’t matter if your project is standard or heavy duty, routine, safety related, maintenance or new construction. We will provide you with the proper expertise and equipment to not only get your job done, but get it done right. We provide commercial and industrial asphalt services for all of the New England area. For additional information, contact us by phone at at (781) 938-6800 or through our contact form here.